These folk art lanterns add soft illumination to any room. Each project requires an electrical wiring harness with bulb and a wire bail handle. Optional colored plastic panel can be fitted behind the decorative cutout. 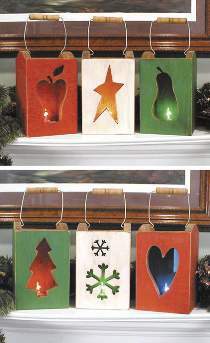 You get FULL SIZE patterns to make six different folk art lanterns, including a heart, tree, apple, star, pear and snowflake. Lanterns measure 5-1/2" square x 9"H. Order hardware parts package separately or see Special Offer. Folk Art Lanterns Hardware Parts Package Includes enough electrical wiring harnesses with clear bulbs and wire bail handles to make six folk art lanterns. Project plan, colored plastic, wood and wood finish are not included.